Land from the house to the roadway madecall the front garden and the fence that separates it from the road - palisade. 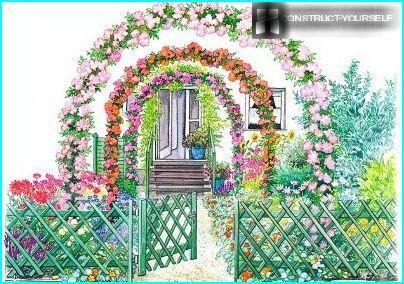 In a small area often arranged flower beds, beautifully decorated path leading to the house, the arch in the colors, the composition of the low trees and stones. This is the place where you can realize the most daring design decisions, and the ability to create an original garden in front of house with his own hands. What in general are front gardens? 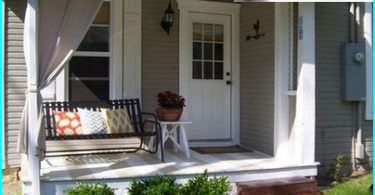 Before the front garden design front of the house, you should get acquainted with the variety of houses adjoining areas and their features. open - Do not have a fence. The space adjacent to the house perfectly visible both from the steps, and with the roadway. 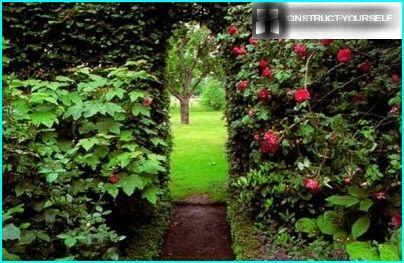 Most often it is neatly trimmed lawn with flower beds and a path leading to the entrance. closed - Fenced off from the street by a hedge or fence (wrought, brick, wood, wicker, stone, metal mesh). Russian type. All that is behind the windows of the house, should, inFirst of all, the owners delight the eye, rather than guests and neighbors. Accordingly, the view from the windows is more attractive than the road. Most likely, the front of house area will be closed on all sides by a fence, though not always deaf, or a dense hedge. But it will be decorated from the heart: and a painted wooden décor, and clay figurines, and many lush flower beds. European type. Here everything is arranged according to strict standards. 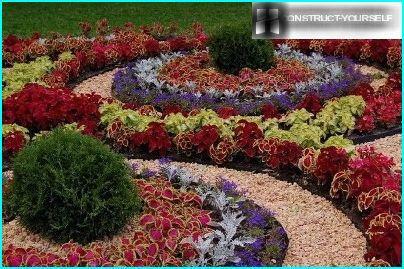 Well thought-out geometry of lines, neatly trimmed bushes and trees, smooth lawns and immaculate flower beds and walkways. Often used outdoors type, so that any passerby could appreciate the quality and design level. 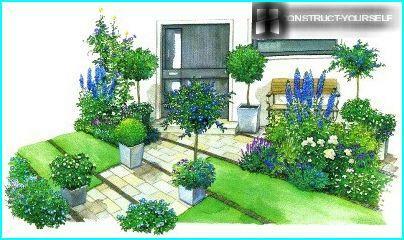 Some homeowners choose design front garden depending on the style: romantic, Mediterranean, Japanese, rustic. 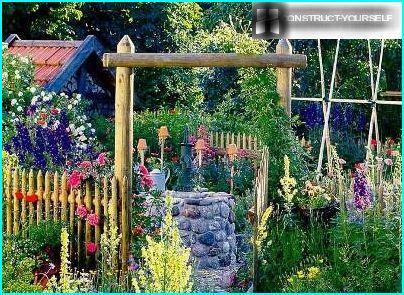 Many people ask: how to decorate the garden with your own hands quickly and inexpensively? 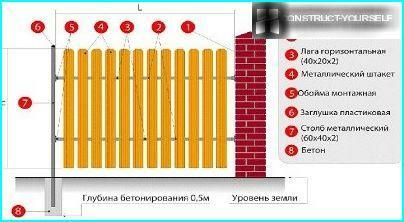 This is easily done by erecting artless ogradku picket. 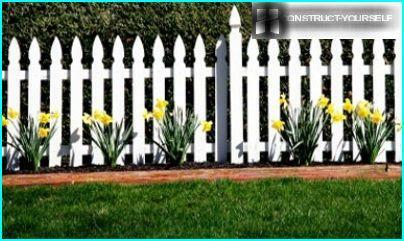 A small picket fence only conditionallyIt performs the protective function, most likely, it is used for decoration and zoning. 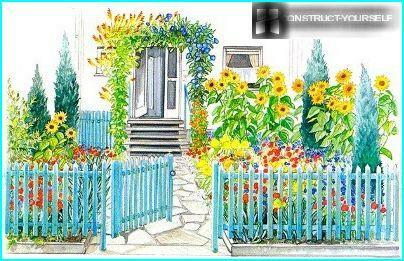 The simple but neat and smooth front garden picket - an option for owners who want to try to force in self-ennobling sector. 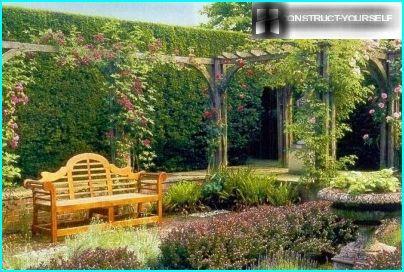 Having on hand a small set of tools and materials, you can slowly gather curly or very simple hedge to the front garden. 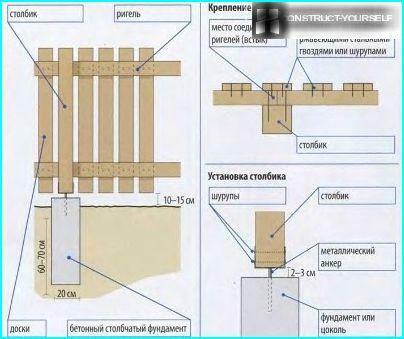 horizontal bars (beams) for fixing the fence 40h100 mm. The first step is dug into the ground on polesthe same distance from each other, starting from the corners. 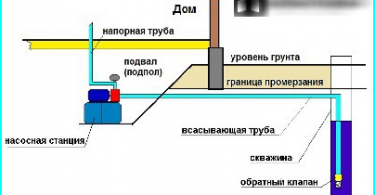 A more practical option - installing them on concreted anchors Metal: dig the hole, it is inserted into the pipe (tin or asbestos-cement), the pipe - galvanized anchor it all pour a mixture of sand and cement. To the pillar screwed crossbars to them - the board. The wicket looks - it's part of the fence, fixed by means of a loop on a support column. The next step - painting boards and bars. To fence served for a long time, it should be treated with a special compound against mold and mildew, and then apply the paint based on mineral pigments and alkyd resins. This combination will protect the wood from rotting and retain its natural texture. Wood perfectly absorbs moisture, soit is necessary that the elements of the fence there were at least 15 cm above the ground. For this reason, you need to get rid of the overgrowth of grass growing along the fence. About one in every three years is necessary to update the fence. 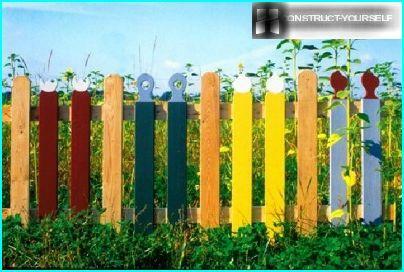 It is possible to change the color of the fence - the appearance of the front garden at once will be different. Wood rassyhaetsya, cracks that can be easily repaired: putty gently and then wipe with sandpaper and paint. Hinges should be lubricated at the gate, so as not to creak. 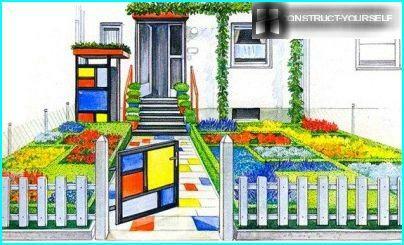 How to make garden without the use of complex technical procedures and construction? Of course, in using plants. Spreading apple and pear trees are more suitable forbackyard, front yard decoration will stam plants. This is not the usual bushes, wild and unkempt, and decorated on the flat trunk crown. Stam currants, raspberries and gooseberries looks unusual, but this is just a neat decorative bar, which will add some elegance front garden. Properly decorated tree is better to buy in the nursery, where the experts knew the secrets of its cultivation. With the help of small trees and shrubs can becreate a hedge. For this purpose, suitable hawthorn, barberry, dog rose. Their delicate flowers adorn the garden springtime and bright fruit and foliage - autumn. Beautiful, geometrically correct compositioncreated with the help of small conifer cone and a spherical shape. 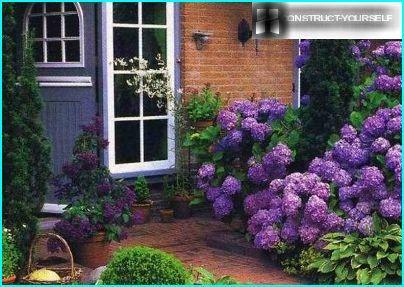 They should not be much, because of the overload of the same type of landscape plantings plants lose its appeal. An exception is the device hedges: Trees planted in a row in front of the facade or the entire perimeter of the site. Better to choose the breed, easily transferring a hairstyle: boxwood, yew, dwarf spruce, thuja. 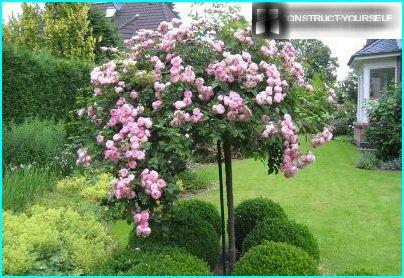 Tall trees for decoration front garden do not fit perfectly - their crowns they close the house facade and the rest of the decor. If the climate allows, the best option - bedscontinuous bloom, which can be pleasing to the eye from early spring to late autumn. 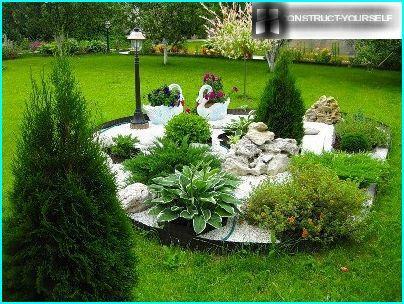 Otherwise, you can use decorative flower beds, decorated with stones or arranged in clay and wooden planters. To make unique flowerbeds planted flowers combine with garden figurines, rocky hills, wooden crafts. Mallow, roses, peonies, dahlias, asters and phlox look great on the background of the rest of the greenery. Successfully use the vines, especially inWhen the frontage is divided into several zones or want to protect it from the roadway. 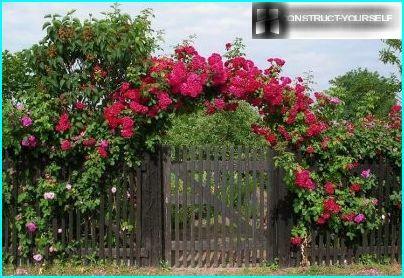 In trellis allowed clematis, wisteria, honeysuckle, Trumpet, climbing roses and vines - for a short period of time they are able to create a true green screen. It is not necessary to arrange garden, usingtraditional principles. It is possible to combine the processing techniques, stylistic nuances, different materials - the main thing to land in front of the house in harmony with the building and was attractive.